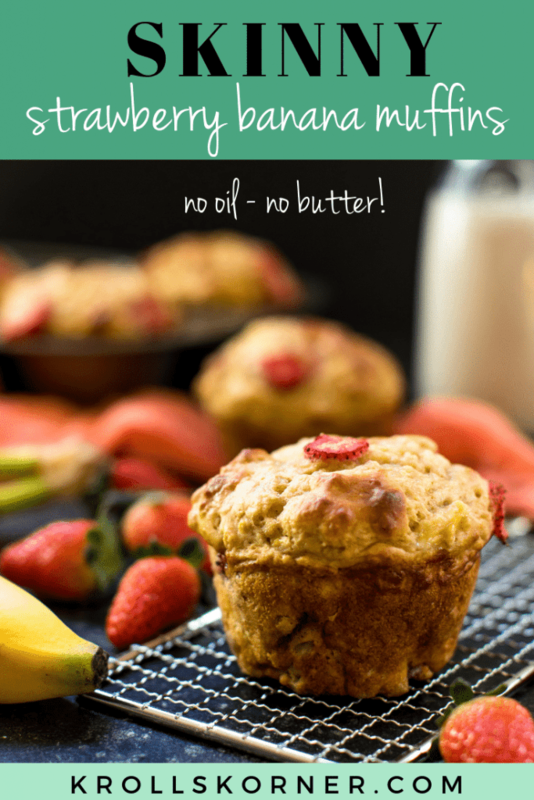 Skinny Strawberry Banana Muffins: free of butter and oil but loaded with flavor! You guys know I LOVE to bake. I make brownies 1x a month because what beats a warm homemade brownie with a scoop of vanilla bean ice cream on top?! As a Registered Dietitian Nutritionist (RDN) with a love for baking, I am personally always mindful of the added sugars being consumed. Instead of avoiding baked goods completely, I give my body what it’s craving in moderation. However, others around me (my boyfriend, family members, coworkers, friends) often tell me they have trouble with consuming sweets in moderation. It’s totally normal and easy to overeat the sweets. I get it! 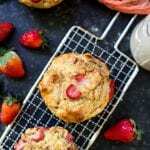 For those looking to indulge, but without a ton of added sugar (especially those with diabetes) these Skinny Strawberry Banana muffins are for you! 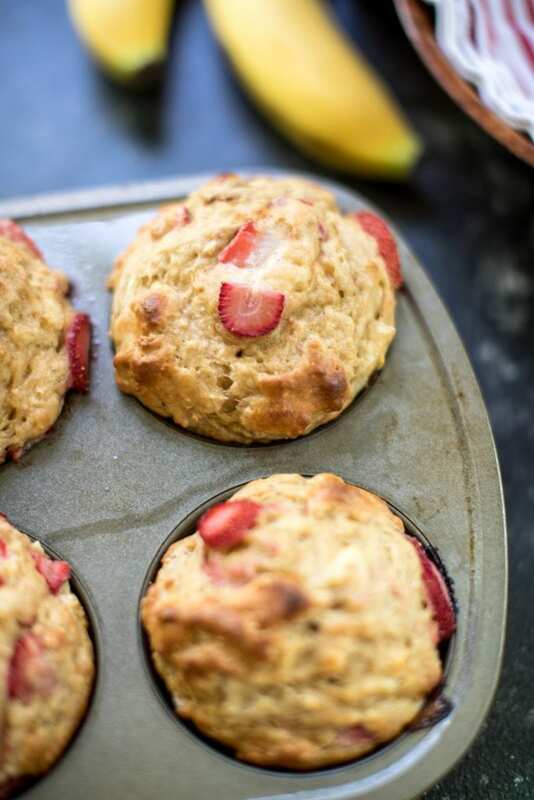 Skinny Strawberry Banana Morning Muffins will melt in your mouth and your heart! 1 cup Greek yogurt, plain or strawberry flavor! In a medium sized bowl, whisk together the yogurt and the eggs. Add in the sugars and whisk again. Then add in the milk, mashed bananas and vanilla extract. Mix well. In another medium bowl, sift together the flour, baking soda, baking powder and salt. Using a rubber spatula, gently fold the dry ingredients in to the wet ingredients. Fold in the chopped strawberries. Be careful to not over mix muffin batter! Scoop the batter into prepared tins and bake for 22-25 minutes. The large muffins take longer so if you use a cupcake pan, I would check on muffins around 15 minutes. Use a toothpick to see if they are done! While muffins cool, make your frosting. Melt butter, then add in the powdered sugar and just a small splash of water. Mix together with a spoon and frost muffins once they have completely cooled down. Enjoy! If your frosting looks too thick, try adding in a tablespoon or 2 of milk instead of the splash of water! If you do not have Greek yogurt, you may use sour cream! 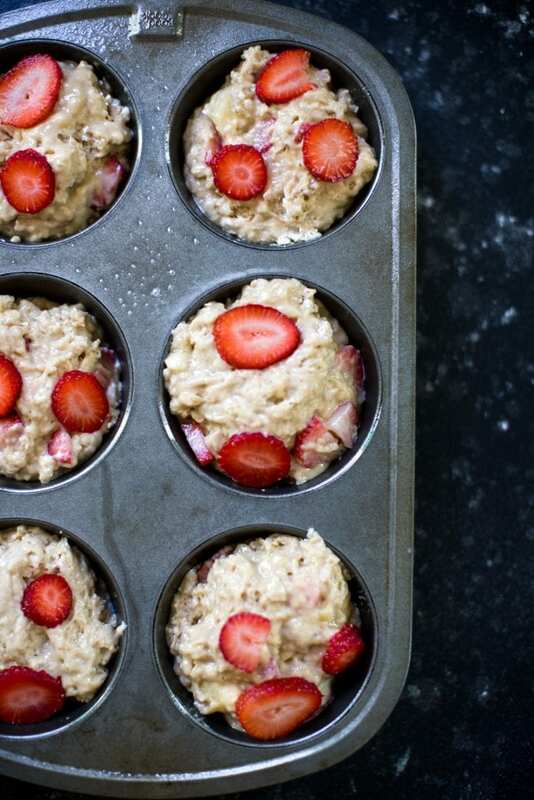 PIN THESE SKINNY STRAWBERRY BANANA MUFFINS FOR LATER! Yum, these are calling my name! These look great – I’m pinning this one for later for sure! Thank you so much Sarah! 🙂 Enjoy! These look like the PERFECT muffin! I’ve never tried Swerve before… now I’m curious! strawberries and bananas are a great combo! These are great! I love using banana in recipes- cant wait to try this! Your photos are gorgeous! Thank Tawnie for the share! These are a great healthy way to start the day! Perfect for a grab n go breakfast!!! The best grab and go brekkie! Thank you! Your strawberry muffins look amazing. I am curious, do you think they would freeze well? I would like to make some and freeze for later. Yes they freeze well!! I hope you love them! Love the combination of strawberries and bananas, especially fresh strawberries, so delicious! These muffins look great! I can imagine how good they taste too! Such a classic and delish combo, thank you so much! While I’m not a huge fan of bananas, I could definitely see myself not only making these muffins but enjoying them as well. I’ll have to make these for brunch. These muffins look so good and I love how light they are, will make a batch tomorrow morning for our breakfast! I hope you love them, thank you!